My love for great Aussie fortifieds has led me to produce something quite unique. A real Liqueur Shiraz! Shiraz grapes were left to hang and whither on the vine, shrivelling and concentrating the sugars and grape flavours. Harvested as raisins, crushed into small picking bins and then fortified with neutral grape spirit during the initial stages of ferment, we were able to trap and preserve the wonderfully intense characters of the super ripe Shiraz grape. 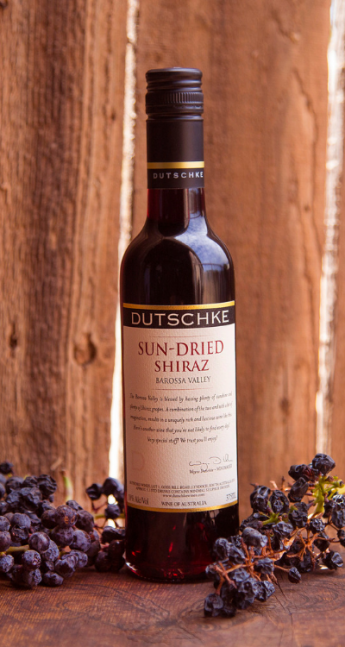 Sun-Dried Shiraz is thick and viscous, with plenty of rich flavours of raisins, black currant, liqorice, plums and a few other red berry fruits. It’s lusciously sweet with plenty of warm alcohol. Having a mouthful of Sun-Dried Shiraz is a great way to finish a cold winters evening and goes real well with stinky cheeses. The Barossa Valley is blessed by having plenty of sunshine and plenty of Shiraz grapes. A combination of the two, and with a bit of winemaking imagination, results in a uniquely rich and luscious wine like this. This wine too, is truly great stuff! Vineyard: Ken & Helen Semmler’s St. Jakobi Vineyard, Lyndoch, Barossa Valley. Oak Maturation: In old French and American oak hogsheads. Deep Garnet in color, the NV Sun Dried Shiraz displays a dried berry, kirsch and spice nose with hints of coffee and licorice. Very sweet and rich with date and fig flavors, it is full-bodied, has just a little bite of tannins and a nice level of freshness through the long finish. Drink it now. Unashamedly sweet and very ripe shiraz fruit, with an almost liqueur viscosity; most unusual and very difficult to point. Screwcap. Your unique opportunity to taste our current release wines amongst the barrels. Click here for more information and to book a time.